From aging soft cheeses on wooden boards to wash-brining fromage, Andy Kehler, co-owner of Jasper Hill Farm in Greensboro, Vt., knows a thing or two about soft cheeses. Although he started his career as a carpenter, Kehler, who co-owns the farm with his brother Mateo, says he got into the cheesemaking business to “find meaningful work” in a bucolic setting of rolling hills and shallow soil. They purchased their dairy farm in 1998—the same year Kehler says Greensboro lost 30% of its dairy farms—and have never looked back. He says it’s partly due to Americans using soft cheese not only as an ingredient, but also as a “table cheese” that can be served as a stand-alone item. “A lot of the flavors in soft cheeses are more accessible to the American palate than a blue cheese or some other pungent cheese,” he says. As more consumers turn towards higher-moisture soft cheeses—from ripened cheeses such as brie and camembert to fresh cheeses such as feta, ricotta and queso blanco—the artisan cheesemaking industry has become more competitive. According to the U.S. Dairy Export Council, more than 25% of the world’s cheese—over 4 million metric tons per year—is manufactured in the United States. Still, Kehler says when he started making cheese about 10% was domestically produced, compared to the 30% to 35% today. “I bet in 10 years it will be the opposite. About 65% of artisan cheese will be domestically produced,” he says. 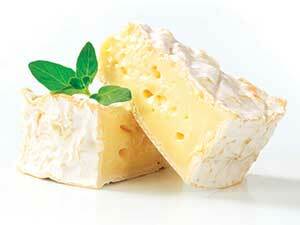 One reason, he says, is because it’s getting harder to import cheese, in particular cheese made from raw milk. The U.S. Food and Drug Administration is currently reviewing the 60-day aging rule that has been imposed on American raw milk cheesemakers since 1949. In 2010, the FDA reduced the standard for non-toxigenic E. coli in raw-milk cheese—the bacteria that are typically harmless and live in every human stomach—from 100 MPN (most probable number) per gram to 10 MPN. As food safety officials conduct a risk assessment on raw milk regulations—which are supposed to be updated this year— some cheesemakers suspect the pending legislation could lengthen the aging time. As a result, some cheesemakers have stopped producing raw-milk cheese—including Andy Hatch, co-owner of Wisconsin’s Uplands Cheese Co., whose company is known for its Rush Creek Reserve raw-milk cheese. Kehler, who makes a popular soft raw milk cheese once a year called Winnimere, made from the milk of Jasper Hill’s hay-fed Ayrshire cows, says pasteurizing cheeses kills all the bacteria— the same bacteria that gives cheese its character. A lot of the bacteria are later added back into the cheese, after being cultivated in a lab, freeze-dried and sold back to cheesemakers.